For people travelling with assistance dogs there are times when they will need to muse public transport. As dog owners will agree it can be very frustrating trying to book a journey or board a vehicle only to be told their dog is not allowed. Is it any different for assistance dogs, do travel companies accommodate them adequately? The department of transport has rules that all taxis and min cabs must accept assistance dogs when they accompany their owners. Obviously there will be times when they cannot accept a booking as the journey may be outside of their area but as a rule all assistance dogs must be accommodated. If an owner feels they have been discriminated against because they have a dog the driver is liable to a fine of £1,000. All assistance dogs are entitled to travel free of charge. Dogs that are allowed to travel in mini cabs and taxis are Hearing Dogs for the Deaf, Guide Dogs for the blind, and other assistance dogs such as Dogs for the Disabled, Support Dogs and Canine Partners. 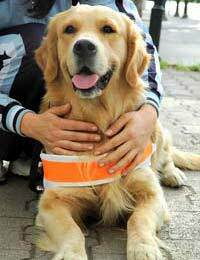 Owners should ensure that the dog is wearing its official jacket or harness which will clearly identify it as an assistance dog. When travelling under the Pet Travel Scheme many UK airlines will now allow assistance dogs to travel within the cabin of the plane. Dogs must fulfil all the obligations of the travel scheme and hold an up to date pet passport just like any other dog does. With so many different companies running our railways it is always advisable to check before setting out on a long journey as to the facilities for assistance dogs. For example in Wales the train service has worked hard to develop information so that owner and dog can travel with ease. As the owner will require space at their feet for the dog to sit they will often need a little more space. Conductors on the trains will identify owner and their dogs and reserve a space suitable for both owner and dog. When booking a reserved seat ahead of the journey the owner will find the seat will have a special highly visible assistance dog sign on the seat where reserved tickets are normally placed. Many towns around the UK are now promoting easy access into buildings and restaurants for disabled owners and their dogs. Hearing Dogs has an award scheme that rewards business for giving a warm welcome to hearing dogs and their owners. Ferry companies differ in the service they can provide to disabled people and their dogs. With some companies the dog will have to stay in the car which is not at all convenient for dog or owner. Other companies are more accommodating. Check with the ferry company and explain your requirements before making your booking. Assistance dogs can now travel with their owners on the Eurostar train to Europe. Dogs will have to hold an up to date Pet Passport.